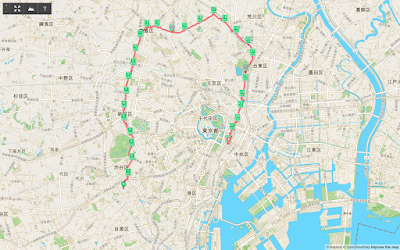 Developing into one of the great urban challenges of Japan, the Yamathon is a 50km+ course around the twenty-nine stations of the Yamanote line in central Tokyo. The rules are simple. You enter as a team of three or four, you take a team photo at each station and you need to complete the course in under twelve hours (though honourable mentions may be given to those crossing the line by the time the venue closes). The actual route is up to the team. The wily will find a course of a little under 50k's however the average is closer to 54. Which is a lot more than the train at about 34k's and the train doesn't need to stop for traffic. The event is run for charity, with entry fees this year being donated to supporting the recovery of Ishinomaki, a town in Tohoku devastated by the tsunami of 2011. A little earlier than last year, when the race was run in June, this year the date is 30th May, footfall commencing at 8.00am near Tokyo station. The weather at this time of year is usually dry being before rainy season, which starts in mid-June, although clear skies may make for a hot day and it is a genuine in-city test of training, planning and endurance. But it's also a fun day out and you'll see a lot of strollers being pushed along, at least for a couple of stations, as families come to support their valiant runners. Last year, pushing the wrong end of my forties, I decided to walk the route on the day without officially entering. I enjoy walking and had a fascinating time exploring areas of north Tokyo into which I rarely venture. Travelling clockwise around the tracks, I made the novice mistake of staying on the outside of the loop, adding a fair bit to the distance. And, at a little under 30k's, my body said 'enough is enough'. But this year I aim to close the loop and complete the distance, taking the tracks south from Shibuya and circling anti-clockwise to the finish line. So whether you fancy walking, jogging or running the distance, I hope you have a great day out for an excellent cause. If nothing else, it's a wonderful way to see those unheralded backstreets of Tokyo. And if you get tired, well, you can always hop on a Yamanote train and head home, resting your weary feet until next year. A great event for a very good cause.